Kenneth Clark was a psychologist who studied the causes of racial justice. He was born in the Panama Canal Zone on July 24, 1914. He died on May 1, 2005. He was married to Mamie Clark. His studies of race and child development helped end segregation. He founded the Northside Center for Child Development in Harlem, New York. 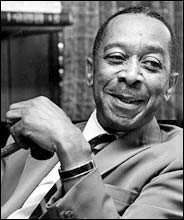 He was the first black man to join the New York Board of Regents and be president of the American Psychological Association. He studied psychology at Columbia University and Howard University. He retuened to Howard University in 1935 to get his master's in psychology. He conducted a televised interview with James Baldwin, Malcolm X, and Martin Luther King Jr. He was a professor at the City College of New York. He retired in 1975 and was Chairman Emeritus of the New York Civil Rights Coalition. Kenneth Clark was concered with the effects racism was having on the self-image of black kids. He conducted tests where he had a white doll and a black doll. He would ask a black child to pick up the doll that looks bad and they would pick up the black doll. He determined that racism was having a negative effect on the black youth.